Every Eid ul-Fitr day, in muslim’s house there is almost always ketupat. It is a staple food made from rice, wrapped by coconut leaves. I thought it is from Indonesia. 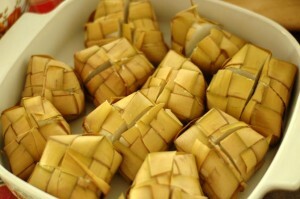 But in fact ketupat or kupat also can be found in Malaysia, Brunei Darussalam, Singapore and Philippines. It is not also served only in Eid ul-Fitr. In Bali, ketupat is also used as ceremony presents. The word “ketupat” or “kupat” derives from Javanese word “ngaku lepat”, which means admit mistake. We hope ketupat tradition can make us admit our mistakes so we can apologize each other. The shape of ketupat is rhombus. In Javanese culture it means four human desires: amarah (anger), aluamah (hunger), supiah (desire to possess something good), and mutmainah (desire to force ourselves). We struggle to conquer those desires during Ramadhan. So, by eating ketupat, we supposed to fight against those all. How to make a ketupat? Generally, it’s simple, I tell you. Ketupat pack is made of janur kuning (coconut leaves) as the symbol to refuse misfortune. People in Indonesia used to make ketupat pack together to show their intimate. But of course we can also buy them in market. Put some rice into ketupat pack, then steam it. Some use santan (coconut milk) to boil ketupat. But in my house, we simply used pure water. Wait for about half an hour. Then, voilà! Now we can serve it. Usually ketupat is served with kari ayam (chicken curry). Yummy! Some say ketupat is symbol of any kind of people mistake. We can find it in the complexity of making ketupat pack. Ketupat also shows the purity of heart after mistake apologize. We can find it from the color of ketupat after we cut it into two parts. As we know, Indonesia has many cultures. So there is various way to serve ketupat. In Kapau, West Sumatra, ketupat is made from sticky rice and boiled in spicy santan. It can be eaten with gulai itik cabe or rendang. Meanwhile in Tegal, Central Java, there is a kind of ketupat called ketupat glabed. It is eaten with thick yellow sauce. We cut ketupat, put fried tempeh fried on it, and pour that thick yellow sauce. We can add sambal (chili sauce) and chicken or scallop satay. In Jakarta, there is a unique serving from ketupat, called ketupat bebanci. The ketupat is served with santan contains meat cooked with any kind of spice such as kemiri, union, chili. In my tradition (only in my house), we do not only make ketupat. Sometimes, ketupat is less popular. We have something else beside ketupat to be served every Lebaran: lontong. It is made from rice too, only it is half-cooked and wrapped with banana leaves. How about you? Do you have different tradition with ketupat or another Lebaran meal? Mais! Je sais pas cuisiner. Je sais manger. Alors, je t’accompagnerai quand il est temps de manger. Comment, comment? Ah, bon. C’est mon devoir de faire la cuisine et tu dois manger ce que j’ai fait. Demain jusqu’a quelques jours apres je ne peux pas travailler comme d’habitude (aujourd’hui aussi). Mais bien sur j’ai le temps pour voir mon e-mail. Donc, dis-moi ce que je dois faire pendant les vacances meme s’il n’y a pas encore la reponse de notre editeur. Rien, rien pour maintenant. Just regard l’email un instant tous les jours. Lho, aku kan mau bikin lontong. Situ maunya ketupat. Ya nggak ada dong. Kok dibilang pelit?